Hello Blogosphere! 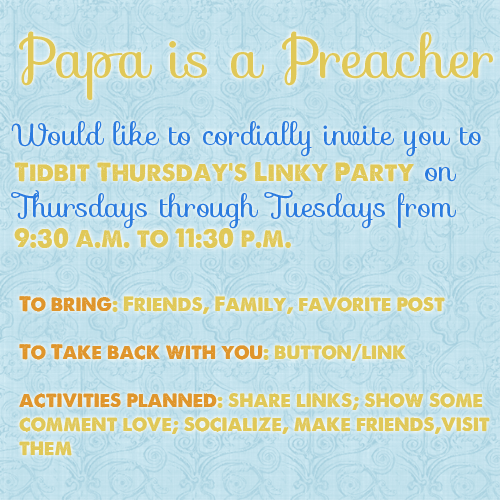 A couple of weeks ago I posted a “Party With Me” post in which I linked a couple of linky parties I often link to. A couple of you suggested I host my own party and you know what, I’ve decided to do just that. But you know, hosting a party is lots of work and also lots of fun. It’s not as much fun, however, if guests don’t show up. 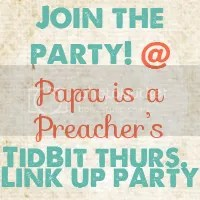 So we are inviting all of you to come to our Link Up Party this Thursday. That’s tomorrow! We’ll be here tomorrow morning all the way ’til Tuesday. We can’t wait to see you and can’t wait to read up on all the posts! Previous Article Visit to Crossview Farm. We're glad to have you here, Mary! I was putting on my nylons in the car on the way over! So sorry I'm late, but I made it! I linked a few minutes ago, having made it here from NaMoPoBlo. (Wait, is that what it's called? Ah, well; you know what I mean.) I haven't done one of these before so am interested in checking everything/everyone out. I'm linked! Thanks for the invite! You've hosted a great party Larissa. It's been fun getting to meet new bloggers with such a variety of talents. 😀 Glad to have you! Thank you Larissa! This is my first time I have done this. Such a heartwarming post! It touches my heart and my eyes were misty from reading both parts! I didn't realize that I put it an old post url. I have updated it to the generic one. May you remove my 1st link? Thank you so much for inviting me to link up, Larissa. Just copy the HTML code underneath the button you'd like and paste it wherever you'd like. (If on the post, make sure the post is on the HTML tab instead of the normal writing tab. If on the sidebar, just “Add a gadget” on your layout page, choose the “HTML” gadget, paste the code and voila!) 🙂 You'll be fine. And if you'd rather, just add a link to the party at the bottom of the post you submit! Yeah, I'm going to just pretend I didn't accidentally post this on a Tuesday instead of Wednesday and then forget the button links. I'm going to blame it on working at the pool for three hours. Must've been all the chlorine fumes. This sounds like fun, count me in!! I'm intrigued! A little confused, but definitely intrigued! You know I'm not very tech-savvy, right? But this seems fun! I look forward to supporting your new party. I'm adding your party button to my Blog Love. I've been following via Bloglovin and now GFC, I would love for you to visit and return the favor. Oh, I totally thought it was MY unsmartypants moment. I'm feeling much better now. I'm in….even if I fear the button will prove my lack of computer smarts, I'm going to try anyway! *sigh* Maybe that's because I needed to add the button text links! Ugh! I'm so sorry. I hope it's clearer now. Pleas excuse my unsmartypants moment. I'm in. I have very little idea about what any of this means, but I'm in. Button? What button? My dementia is part of my charm, I promise. I'll figure all of this out and try not to embarrass you. Awesome. I love inky party.